« Climate-resilient agriculture requires both global and local action. Here’s how. At the same time the trophy ban was making headlines across the globe, a different story was unfolding back home. A great American wildlife conservation story was being rewritten. The greater sage-grouse isn’t a species most people come to know as children when they visit the local zoo, but it’s an icon of the American West, with its ancient mating ritual and spiky tail feathers that give it the look of a punk rock peacock. The bird is considered an indicator species because its success is a strong indicator of the health of the broader sagebrush ecosystem, which supports more than 350 other species, including game species like pronghorn and mule deer. In stark contrast to this celebration of a major wildlife win, Interior Secretary Ryan Zinke is now revisiting the existing sage-grouse plans. On December 27, he reversed key guidance requiring BLM to prioritize leasing and development outside of greater sage-grouse habitat management areas before considering projects within the bird’s habitat. Since 2015, BLM had refused to offer many leases because of concerns for sage-grouse. However, in 2018, there has already been a significant increase in oil and gas leases offered for sale. If oil and gas development in greater sage-grouse habitat continues, it will be a different kind of horror show – one that will affect people and wildlife here at home. If oil and gas development continues without respect for the conservation measures committed in the plans, the bird will likely lose its last remaining stronghold habitat on public lands. By ignoring the science, these actions are likely to cause sage-grouse populations to plummet, bringing the species closer to the brink of extinction. If the bird is put on the endangered species list, we’ll know why. As the president caters solely to the interests of the oil and gas industry, he is putting America’s wildlife, landscapes and natural heritage at risk. It’s no way to put America first. And it doesn’t even make economic sense. For starters, reversing the sage-grouse plans will hold up millions of dollars invested in sage-grouse conservation programs – dollars that would otherwise be flowing to western states for projects on the ground. It will also hurt the outdoor recreation and tourism industries, which benefit from roughly $1 billion a year in economic output driven by sage-grouse. Ultimately, western jobs and livelihoods will suffer. But it’s not just about the sage-grouse. Trump’s broader strategy of selling off public lands, weakening environmental standards and increasing energy development is a losing strategy that puts short-term industry profits over the long-term viability of the western landscape and way of life. It will have broader consequences for the $25-billion restoration and $887-billion recreation economies, which directly support nearly 8 million American jobs. It will be a different kind of horror show – one that will affect people and wildlife here at home. I would like to see president Trump as outraged by these threats to America’s wildlife and economy, and come down on the side of protecting the greater sage-grouse and keeping the existing plans in place. This entry was posted in ecosystems, Endangered Species Act, Wildlife Protection and tagged America first, conservation, elephant trophies, Endangered Species Act, greater sage-grouse, Interior department, oil and gas, ryan zinke, trophy hunting, wildlife. Bookmark the permalink. Both comments and trackbacks are currently closed. Save the sage grouse. 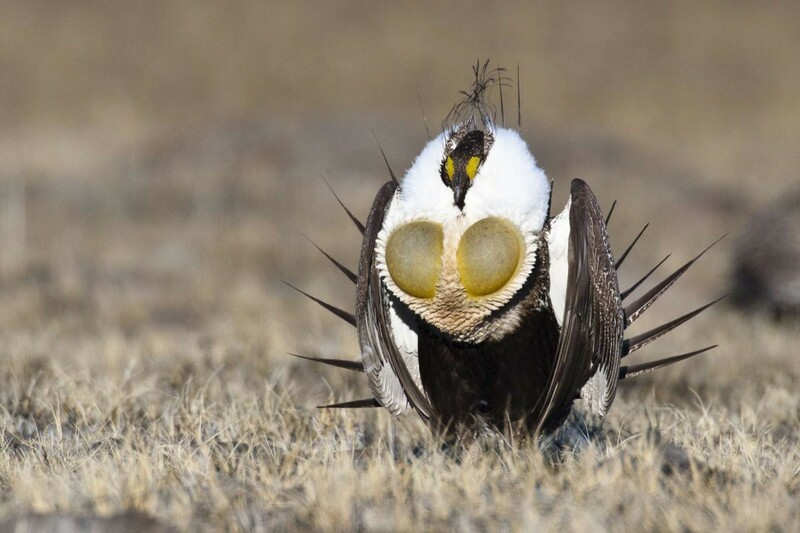 Stop the activities such as oil pipelines that are wrecking sage grouse habitat. We can’t let the sage grouse go—we are losing species by the handfuls. STOP the oil pipelines Stop them from doing this. I vote and I will help vote out ANYONE in my district and state if they support this .